I recently ordered some small 13x13mm GPS antennas from TME to test them on NEO-6 GPS receiver modules. Well that is no problem since you can solder them yourself. The image above shows the back of the antenna with landing pattern for soldering the coaxial cable. It’s not the best picture as it was shot through the antistatic bag the antennas came in, but it is the only picture of the antennas without the cables I have taken. 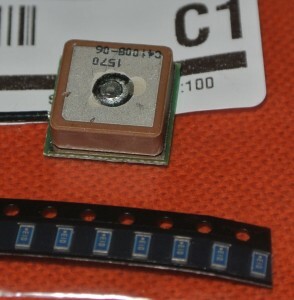 Luckily also many other RF modules use U.FL connectors due to their small size. I had some U.FL -> SMA cables lying around. So I simply cut off the SMA end leaving me with a section of thin 50R coax cable with an u.FL connector attached. There is a nice manual on how to solder a thin coax cable in Quectel hardware implementation manual, you should have a look at the 4.5. RF cable soldering section. You should strip your coax so that there is a few sections on it (from the soldered end in). 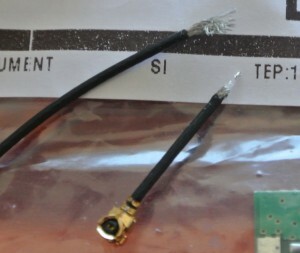 In the picture you can see the smaller cable already stripped and ready for soldering to the antenna. 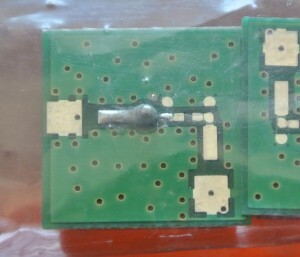 Also the landing pattern on the PCB of the antenna is configured for soldering like this. You should match your section lengths to the landing pattern. First solder the inner conductor. Then solder the outer conductor to the PCB. You should be careful not to overheat the cable and cause the dielectric to deform. Also I suggest not to do any pre-soldering (solder coating) of the conductors. I also ordered some tiny chip GPS antennas along with the “big” ones, but these, although only measuring a few mm need a specific PCB pattern and ground configuration for them to actually work as intended. So which soldering brand do you generally use? What tip size did you use for this project? I really like Ersa soldering irons we use at work, but any brand name like Weller or similiar will probably work. 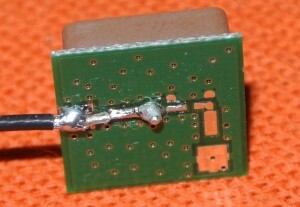 This soldering work was actually done using Yihua brand (Hakko clone) soldering iron. Even the cheap chinese soldering equipment works completely ok, but you should definitely look for something with temperature control (analog temperature knob is quicker to set, digital display is also nice to have) and at least 40W power. If you have used a great soldering iron (like Ersa iCon) you will probably miss the quick power on heatup time and automatic standby mode, but other than that there is not much difference between a 50EUR and a 500EUR soldering iron. Big soldering tips, eg. 900M-T-1.6 as used in this project or even something like 900M-T-K are actually better for soldering (even for most of the small things like 0.5mm pitch) as thin tips may have difficulty conducting enough heat. Also in coax cables the dielectric may melt if you solder too slowly.